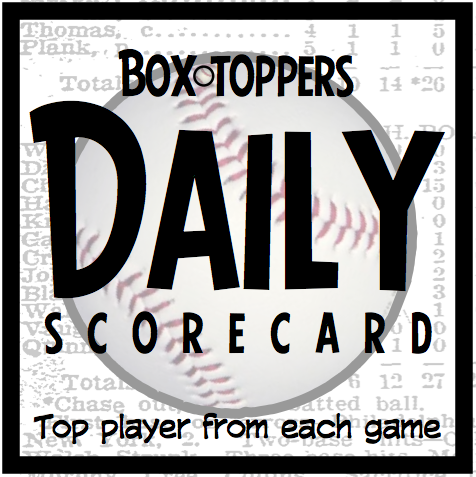 Orioles pitcher Chris Tillman is Friday's Player of the Day. Tillman pitched seven scoreless innings, gave up two hits and struck out eight in the 6-0 win over the Red Sox. Diamondbacks pitcher Randall Delgado is National League Player of the Day. Delgado pitched a complete game shutout in the 10-0 win over the Padres. Daniel Murphy of the Mets is NL Batter of the Day. Murphy hit two home runs, drove in five runs and went 4-for-5 in the 11-0 win over the Nationals. Edwin Encarnacion of the Blue Jays is American League Batter of the Day. Encarnacion hit two home runs, drove in five runs and went 3-for-4 in the 12-6 win over the Astros. Notable: Dodgers pitcher Clayton Kershaw (8IP 1R 8K in the 2-1 win vs. the Reds) was Player of the Game and earned 1.0 Box-Toppers point, giving him 14.7 points for the season, in fourth place overall among players this season. Tillman receives 2.0 Box-Toppers points for being Player of the Day. Delgado receives 1.7 for NL Player of the Day. Murphy and Encarnacion each receive 1.5 for being top Batter of the Day in their league.